Chocolate Caramel Tart - Great Blogger Bake Off! Despite not being the best of cooks I love watching The Great British Bake off and it always inspires me to want to get out in the kitchen and bake. For those of you who watch the program you will have seen that last weeks theme was pastry and so this week I decided to attempt my own pastry creation in the form of a chocolate caramel tart! 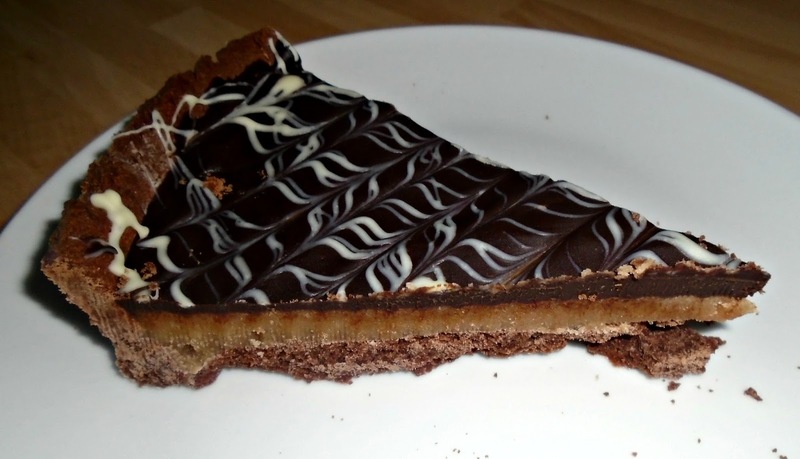 The tart featured on Bake Off was actually a bakewell tart but since nobody in our house is a fan of Jam except me it seemed a waste, hence the chocolate caramel tart. So here is the recipe and how ours turned out, please do let me know if you have a go I would love to see your creations too over on Facebook! I started by making my pastry since this really benefits from some time chilling in the fridge before your roll and bake! I also made my pastry in my Kitchenaid mixer but you could do it in a bowl with an electric whisk or by hand if you don't have this to hand. For the Pastry - In the mixer I added the butter and sugar and mixed together until well combined. I then added the egg yolk and vanilla and mixed again until combined. Next I sieved in the flour and cocoa powder and mixed on a low setting until well combined and until my pastry and formed a dough in the mixer. I then removed from the mixer, wrapping in cling film and placed in the fridge to chill for serveral hours (try and leave for at least 1 hour). Once your pastry has been left to chill roll it out between 2 sheets of grease proof paper to as thin as you like your pastry ensuring you roll it out big enough to fit your tart dish. Place your rolled out dough into your dish and prick several holes in the bottom. Place a layer of grease proof paper over the top and fill with baking beans (or rice/dried lentils) and blind bake at 180C for 15 minutes. Remove the greaseproof/ baking beans etc and bake again until pastry if fully cooked (around 5-10 more minutes). Leave to cool. For the Caramel - In a large pan place your water, syrup and granulated sugar and cook on a medium - high heat, swirl the pan occasionally until your mixture becomes a dark, amber caramel colour. Carefully add in your butter and cream and whisk (your mixture will bubble up!). Allow the caramel to cool a little, whilst it is still liquid enough to pour add the caramel to your pastry case. Allow this to set for at least 45 - 60 minutes before adding your chocolate to the top. For the Chocolate Topping - Place some water in to a saucepan and place on the a medium heat. On top of this place a heatproof bowl and in to in place your cream and heat until boiling. Whilst your cream is warming up finely chop your chocolate in a separate bowl. Once your cream is hot pour over the chocolate and leave for 2 minutes. Now mix the chocolate and cream mixture and the cream should have melted the chocolate. You can now pour this over your caramel tart and leave to set. I added some white chocolate feathering to mine (since this is what the bakers did with their bakewell tarts on The Great British Bake Off!). It was simple to do, I simply melted a small amount of white chocolate in the microwave then spooned it in lines across the top of my tart. 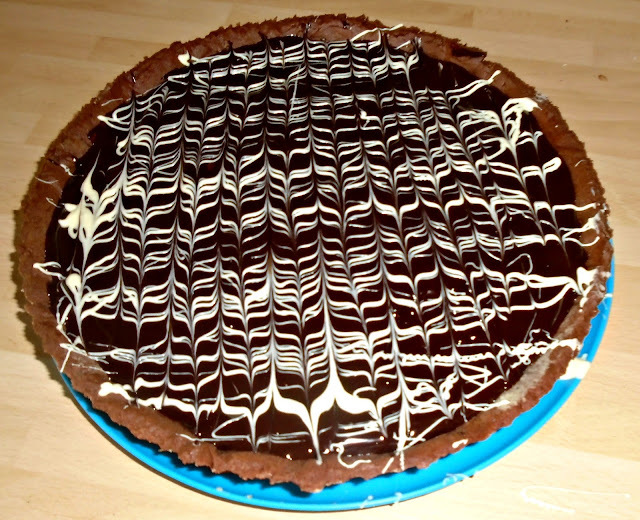 I then used a cocktail stick to drag through the chocolate to create the feathering effect. Unfortunately I left my pastry case to bake a little too long (I blame a toddler trying to climb my leg!) which made it a little crumbly but otherwise it tasted really cook, the kids especially loved it! Its very sweet though so you do only need a little at a time. I actually brought a back up caramel from Tesco as I was so unsure how mine was going to turn out. However it was so simple to do so I would definitely say have a go at making your own! I had lots of fun attempting this though and it has definitely made me want to try more pastry idea's so watch this space! 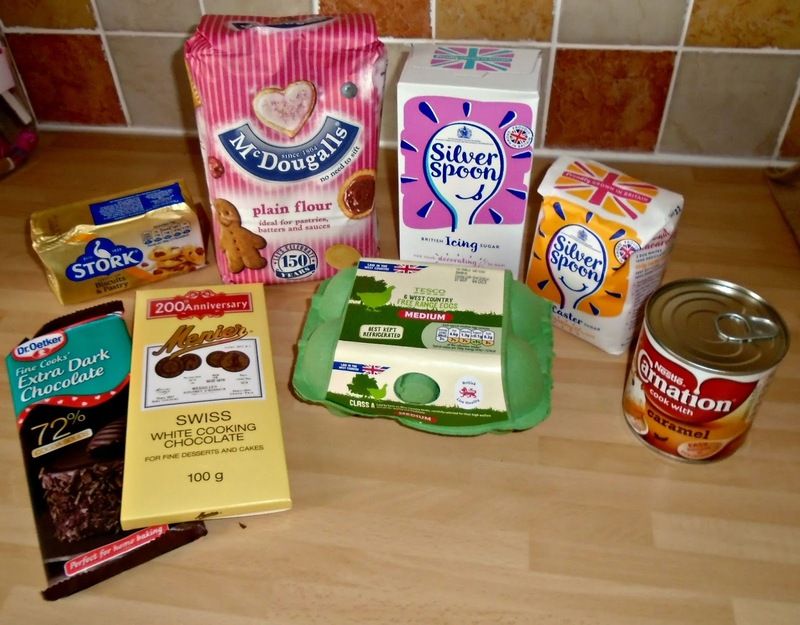 I was provided with voucher from Tesco to purchase ingredients for this bake, I had total control over what I purchased and made. all opinions, thoughts and photos are my own. This looks amazing, caramel is one of my fave things so I would love a slice of this! Ohhh that sounds rather naughty but nice! Love the feather icing so dramatic.